To establish and verify your Lync system’s connection to Exchange Online UM, follow these steps. 1. Install and configure Microsoft Lync Server to provide instant messaging, presence and basic audio functionality. 2. Install and configure one or more Microsoft Lync Edge Servers (see the Lync documentation above for details on how to create a hosting provider object). Ensure that the Edge Server(s) is/are configured for integration with Exchange Online UM (the documentation is here). 3. 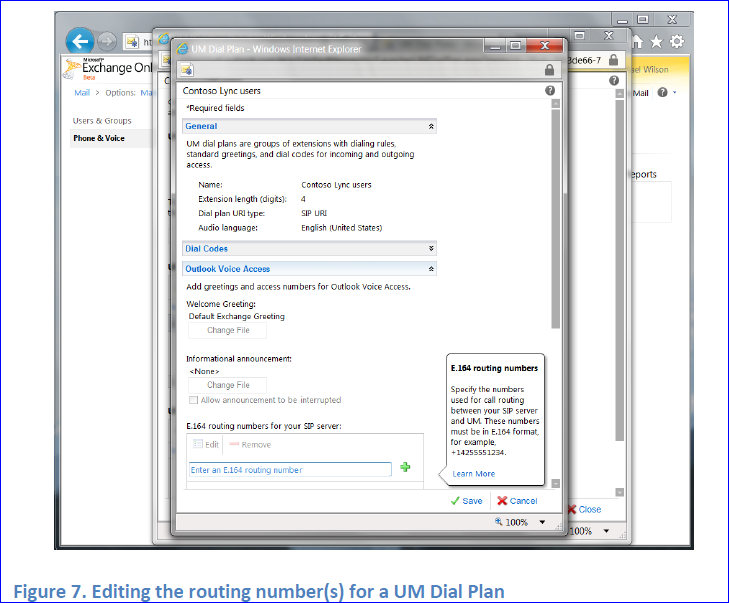 In Exchange Control Panel (ECP), create a new UM Dial Plan for the Lync users who will be enabled for Enterprise Voice, and use Exchange Online UM for voice mail. 4. In ECP, on the new UM Dial Plan, set the E.164 routing number. This must be a telephone number in the E.164 format, that is, a ‘+’ character, followed by a country code, followed by an in-country telephone number. For example, +14255551234 (United States) or +442089991234 (United Kingdom). This is the key by which UM Online will identify the correct Dial Plan when handling calls, so it must be unique within your organization. It should correspond to an actual number that users can call if they want to listen to their Exchange UM voice mail with a telephone (land line or mobile) rather than the Lync client. If necessary, you can supply two or more numbers1. The number(s) are stored on the UM Dial Plan’s PilotIdentifierList property. 5. 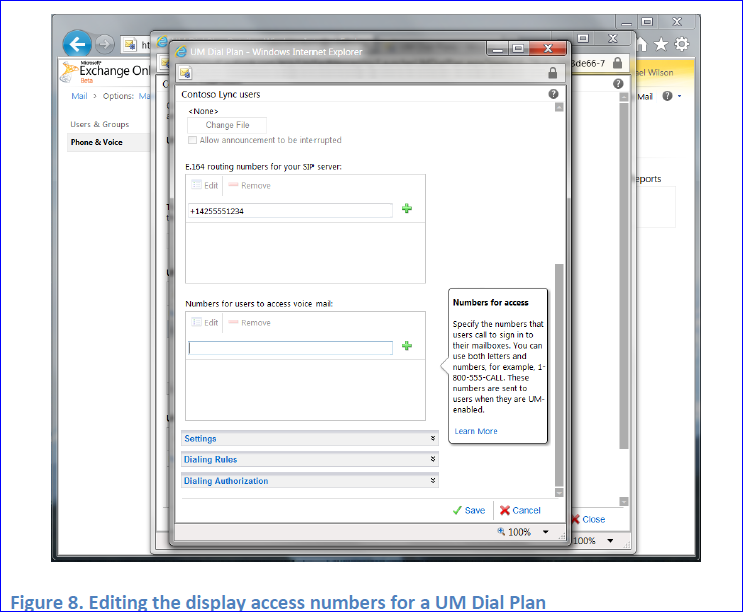 In ECP, on the new UM Dial Plan, set a number for user access. Unlike the routing number (step 4), this can be in any readable format, because it is for display to users. For example, if the routing number were “+14252668676”, the user access number could be set to “(425) 266-8676” or “425-CONTOSO”. Two or more values can be supplied. The user access numbers should be consistent with routing numbers, or users will be confused. The user access number is included in the body of the “Welcome to Exchange Unified Messaging” e-mail that is sent to each user when they are UM-enabled. It is also displayed in the Outlook Voice Access section of the user’s Phone personal options (accessed via OWA/Exchange Control Panel). 1 One reason to do so might be so that users had the option of calling a toll-free number when in the same country as Lync, but another number when calling from a different country. (Toll-free numbers are sometimes not reachable from other countries). Here, the global Hosted Voice Mail Policy is modified (because the Identity parameter is left unspecified, the default is assumed). 2 The command could be typed all on one line, but this example is easier to show on a narrow page. 10. In Lync, enable a test user account for Enterprise Voice (or select an existing Enterprise Voice-enabled user for testing). 11. In Exchange Control Panel, enable a test user for Unified Messaging. This user object must correspond3 to the same user that was used in step 10. Specify the default UM Mailbox Policy that is associated with the UM Dial Plan that was created in steps 3 – 6. 12. Manually, or using the UM Troubleshooting Tool, verify that user’s Unified Messaging functionality is working. No proximo post veremos como conectar soluções de telefonia ao Exchange Online UM.